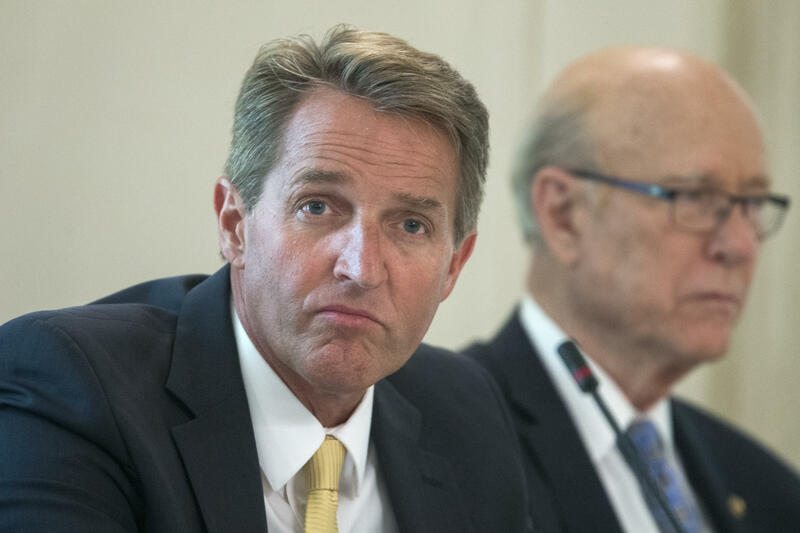 Sen. Flake on "crisis of principle"
Arizona Republican Sen. Jeff Flake, who has had a contentious relationship with President Trump, thinks it's possible Mr. Trump may face a primary challenge in 2020. During an interview with Georgia Public Broadcasting Wednesday, he was asked if he thought the president could be challenged in the Republican primary. "I think that certainly depends on him," Flake said. "I think he could govern in a way that he wouldn't. But, I think that the way that -- the direction he's headed right now. Just kind of drilling down on the base rather than trying to expand the base -- I think he's inviting one." Flake faces a primary challenge from Kelli Ward, a doctor who also unsuccessfully challenged the senior senator from Arizona, John McCain, in 2016. A week ago, Mr. Trump tweeted that it was "great to see" Ward was running against Flake, whom he also called a "non-factor in the Senate" in his tweet. At a rally in Phoenix Tuesday, in Flake's home state, the president called him "weak," though not by name. The next day Mr. Trump did name him, declaring in a tweet that he's "Not a fan of Jeff Flake, weak on crime & border!" On Thursday, Fox News asked Flake why it is that Mr. Trump isn't "a fan." "I don't know," Flake responded. "I want to work with the president when I think that he's right, and I'll challenge him when I think that he's wrong." Flake is already doing that -- for instance, he thinks Mr. Trump is wrong about his threat to shut down the government over funding for a southern border wall. "If we have to close down our government, we're building that wall," the president vowed Tuesday. Flake told "Fox and Friends," "We don't need a government shutdown. That never ends well. We don't save money doing it." As for that border wall, Flake opined that "the president and all of us share the same goal: to have a secure border." And that's not an objective to be attained with just a wall, the Arizona senator believes. "What we need to do is say 'what does that mean?' Where do we need fences, where do we need sensors, where do we simply need surveillance to get a secure border? That's the goal," Flake said. "Not just to fulfill a campaign promise of a wall - you know, it doesn't make sense in certain areas, certainly in Arizona."